Other than in John’s gospel, have you ever read a book about the life of Christ that roots His existence in eternity? So much is written about His last week, but can the events leading up to the cross, the resurrection, and ascension ever be grasped apart from His eternal context? Can we truly appreciate Jesus of Nazareth without knowing Him as the Creator God? 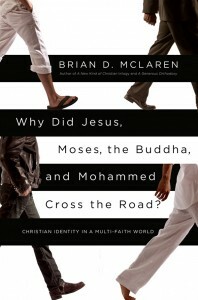 I have asked that to underscore the fact that this is not ‘just’ another book about Christ. Sweet and Viola are the dynamic duo who presented us with ‘Jesus Manifesto’. If that treatise deepened your walk with Jesus, you’ll be more enriched by this new volume as it digs far deeper into the metaphors and symbols of the One we cherish as both Savior and Lord. In sixteen chapters this Sweet and Viola begin their story before time, lead us through time, and finally help us see beyond time. They pull together His whole story in a manner, if we really grasp its full significance, that ought to seriously reshape our worldview and thus the way we live each day. Enjoy. In what has now become normative from McLaren, this most recent book invites the reader to stand outside his or her usual bubble in order to see and to carefully consider the issues of our day. Having cut loose from the busyness and conformity requirements of institutional religion, the author has become free to contemplate and imagine more Christ-like responses for our 21st century world. This book comes alongside a growing trend among respected spiritual leaders who seek unity in diversity. How can the many different religious beliefs co-exist in a smaller and smaller world? How can we honor and remain faithful to our own beliefs, yet respect the beliefs of others? What will it take to move beyond a ‘my way or the highway’ mentality in a world that will always have a multitude of religious notions, yet they are increasingly mixed within rather than isolated by geography? What are the obstacles and what are some of the possible solutions? What will be the consequences if we neglect to deal with this subject? I appreciated the shortness of each of the 29 chapters as well as the the clear division of the book into for parts – The Crisis of Christian Identity, The Doctrinal Challenge, The Liturgical Challenge, and The Missional Challenge. On the other hand, I’m not a big fan of ‘how to’ or ‘how the’ books – which is the way each chapter begins. I appreciate brief stories, appropriate quotations, and an abundance of references. Yet, I didn’t find the author’s writing style crisp enough to clearly and convincingly deliver his message. Maybe this was because he tried to cover to much in one book or maybe he is still thinking through many of these ideas. Whatever the case, it is a worthwhile, thought-provoking read.